According to a new survey, managers consider themselves smarter, a better coach, and more visionary than many of their underlings believe. Earlier today, we revealed which CEOs, celebrities, and politicians were considered the most wanted bosses, according to a new poll by HR company Adecco. But not everyone can have their ideal boss–and in fact, most don’t. 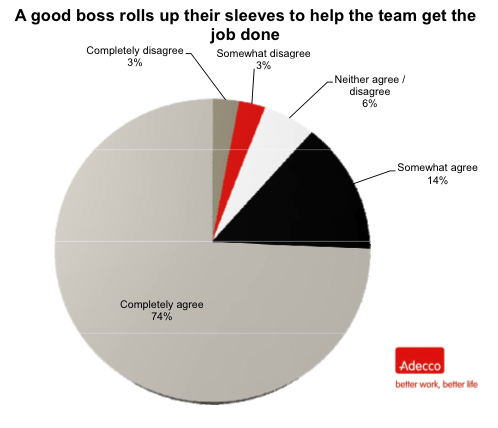 Adecco’s poll also asked 700 employees and 300 bosses from blue and white collar industries about the relationship between workers and management. The results make all bosses seem a little more like Michael Scott–and might make them rethink their next interaction with employees. 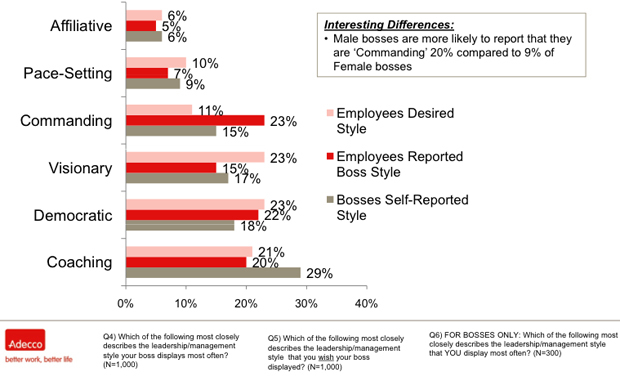 When asked to report on leadership style, bosses and employees disagreed in certain categories. Only 15% of bosses described their own management style as commanding. About 23% of employees, on the other hand, reported their boss’s style to be commanding, and just 11% said being commanding was the desired style. “Bosses may not recognize how bossy they actually are,” the report says. Similarly, bosses believe they are visionary leaders and good coaches; their employees disagree. “Nearly one in three bosses may think they are using a coaching style, but only one in five employees agrees,” concludes Adecco. Only 17% of bosses are self-styled visionaries, whereas close to 23% of employees view this as the preferred leadership style. More than one out of three employees think they are smarter than their bosses, even if they are more educated. Younger generations tend to think this way more: 41% of Millennials and Gen-X’ers believe they are smarter than their bosses, compared with just 30% of Baby Boomers. Age difference is an integral part of respect. While the vast majority of bosses and employees share mutual respect, age disparity can cause significant problems with respect. Could you respect and work with a boss who is two years younger than you? 89% agreed. Ten years? Only 68% agreed. Twenty years? The number drops to 56% of respondents. One area where most respondents agreed: Bosses must be willing to get their hands dirty. When asked whether a good boss is willing to roll up his or her sleeves to help the team get the job done, nearly three-quarters completely agreed, with another 14% somewhat agreeing. Do You Want the Top Spot? Interestingly, though many respondents offered criticism of their boss’ style and approach, very few are interested in a management position. 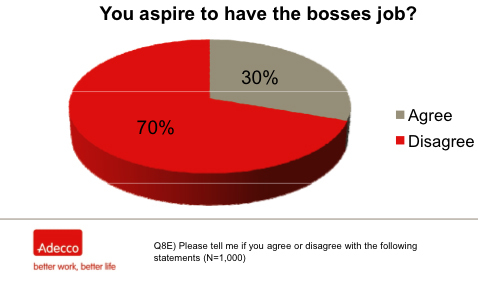 A surprising 70% said they did not aspire to have their boss’ job. Moreover, aspiration also varies based on age, gender, and other factors. Around 36% of men aspire to have their boss’ job, compared with just 23% of women. Only 18% of Boomers aspire to the same positions, compared with more than double the numbers of Gen-Xers and Millennials. Lastly, respondents with kids at home were more likely to aspire to their boss’ job (39%), compared to 23% without children. So what is your management style? Are you a visionary? 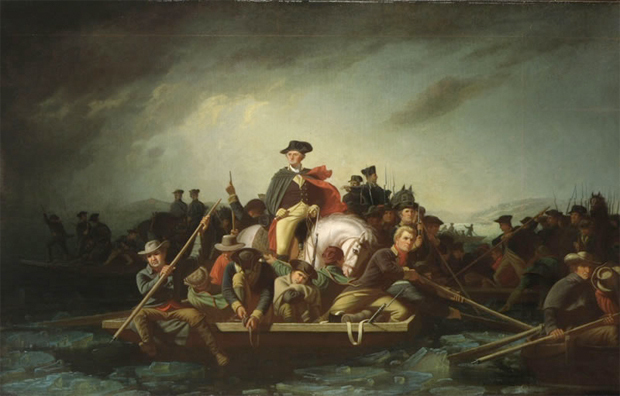 A commander or a coach? Think again. Don’t forget: A third of your employees believe they are smarter than you.